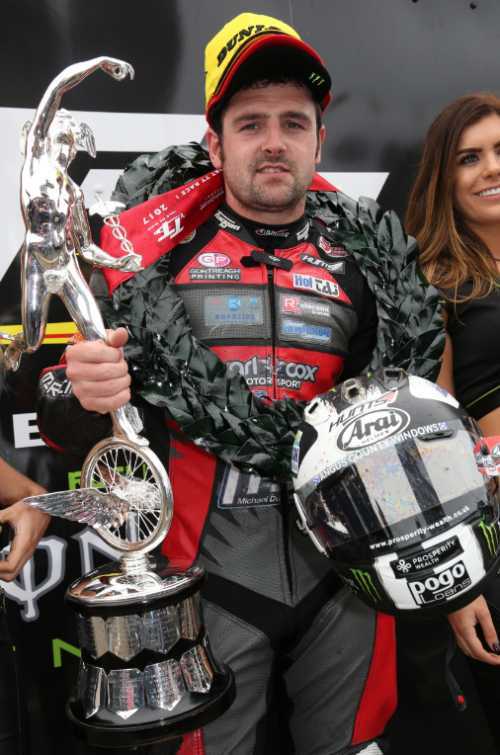 Michael Dunlop took his 14th Isle of Man TT victory this afternoon (Monday) to equal Mike Hailwood’s 14 wins when he won the 4-lap Monster Energy Supersport race by 13.2 seconds from James Hillier. The Northern Ireland rider overhauled Hillier half way round the first lap but it was only on the final lap that he pulled clear as he took his first 600cc win since 2014. Peter Hickman took third for his second TT podium in as many days and set the fastest lap of the race on the final lap at 126.848mph. Overnight conditions led to a delay of just over two hours 15 minutes but the race finally got underway shortly after 1pm with riders warned of damp patches at Ramsey Hairpin, the Nook and Governor’s Dip. And, as in Sunday’s RST Superbike race, Hillier on the JG Speedfit Kawasaki was again quickest on the first nine mile run to Glen Helen. His advantage over William Dunlop (Caffrey International Yamaha) was only 0.4s with Michael Dunlop (MD Racing Yamaha) just 0.01s behind his brother. Gary Johnson, Dean Harrison and Peter Hickman completed the top six with Sunday’s Superbike TT winner Ian Hutchinson back in seventh. By Ramsey Hairpin, Dunlop had taken over the lead but it was still extremely tight - his advantage over Hillier just 0.09s. William Dunlop was a further 1.5s back in third as Johnson, Harrison and Hickman held onto their top six positions. Hillier had re-taken the lead by the time the riders swept through the Bungalow and an opening lap of 124.743mph gave him a slender 0.397s lead over Michael Dunlop as Harrison moved up to third. William Dunlop dropped back to fourth with Johnson in fifth and Hutchinson moving up to sixth as 9.6s covered the top six. However, by Glen Helen on lap two, Dunlop was 1.8s clear of Hillier with William Dunlop now up to third after Harrison retired at Ballacraine with a broken gear lever. That promoted Johnson up to fourth, Hutchinson fifth and Hickman sixth. Through Ramsey second time around and Dunlop had eked out his advantage to 3.2s with brother William still in third but now 10s behind Hillier. Hickman (Trooper Beer Triumph) had overhauled Hutchinson for fourth while Johnson was only 0.1s behind the McAMS Yamaha rider in sixth. At half race distance, and coming into the pits for fuel, Dunlop’s lead was down to 2.4s with a second lap speed of 126.015mph and it now looked a two-horse race between him and Hillier with William Dunlop now a further 15.8s adrift in third. Hickman had closed to within 4.5s as Hutchinson remained in fifth. Dan Kneen was sixth coming into the pits but a 60s penalty, for going down pit lane in excess of 90kmh, dropped him way down the order. Jamie Coward’s good run came to an end when he retired while eighth but at Glen Helen on the third lap, Hillier had reduced Dunlop’s lead to 1.8s while William Dunlop had pulled back an extra second over Hickman. Dunlop had an excellent run from Glen Helen to Ballaugh, doubling his lead and by Ramsey, had increased it further still to 5.9s. As his lead was extending, the fight for the final podium position was intensifying and Hickman had nosed ahead of William Dunlop as they started their final lap. The final 37.73 miles around the Mountain Course saw Dunlop finally pull clear and he eventually took the chequered flag by 13.2s. Hillier took his tenth TT podium in second with Hickman having another excellent ride and retaining third. William Dunlop had to settle for fourth with Ian Hutchinson an unusually distant fifth after dominating the class in both 2015 and 2016 - his run of 11 successive podium finishes ending. Johnson completed the top six ahead of Bruce Anstey. Kneen fought his way back up to eighth as Conor Cummins and James Cowton rounded out the top ten. The results mean that Hutchinson and Hickman are now tied at the top of the Joey Dunlop TT Championship on 36 points with Hillier only three points behind in third. The battle for the TT Privateer’s Championship saw the honours today go to Craig Neve in 14th overall, one place ahead of local rider Andrew Dudgeon followed by Daley Mathison (16th) and Horst Saiger (17th) while newcomer Adam McLean had a great ride into 18th. Saiger now has 38 points with Sam West on 27 and Neve on 25. Tom Weeden was reported to have had an accident at Brandywell and was taken by airmed to Nobles Hospital where he received treatment for chest and back injuries.